Bay of Bengal Depression System has tracked West Northwestwards towards Jharkhad/M.P and has weakened into a Well Marked Low Pressure area and now lies over Northeast Madhya Pradesh and neighborhood. 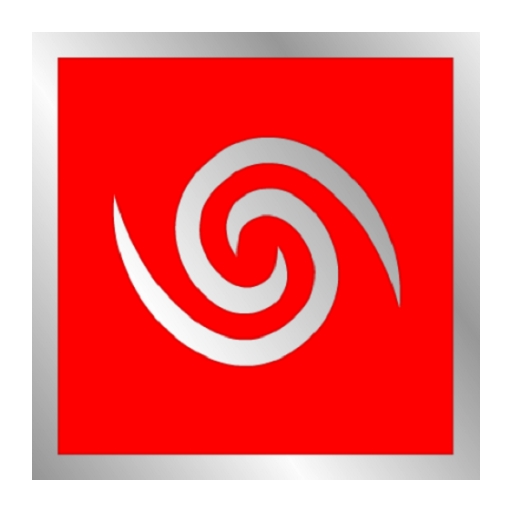 Associated Cyclonic Circulation extends up to 5.8 km above mean sea level tilting Southwards with height. The Axis of Monsoon trough at mean sea level now passes through Bikaner, Jaipur, Gwalior, Sidhi, Center of the Well Marked Low Pressure area over Northeast M.P. & neighborhood and thence to Northeast Bay of Bengal. There is a UAC over Northeast Rajasthan and adjoining Haryana at 1.5 km above mean sea level. The Bay of Bengal System will track towards North M.P. and neighboring U.P. and Delhi. The UAC of this System is expected to be over North M.P. 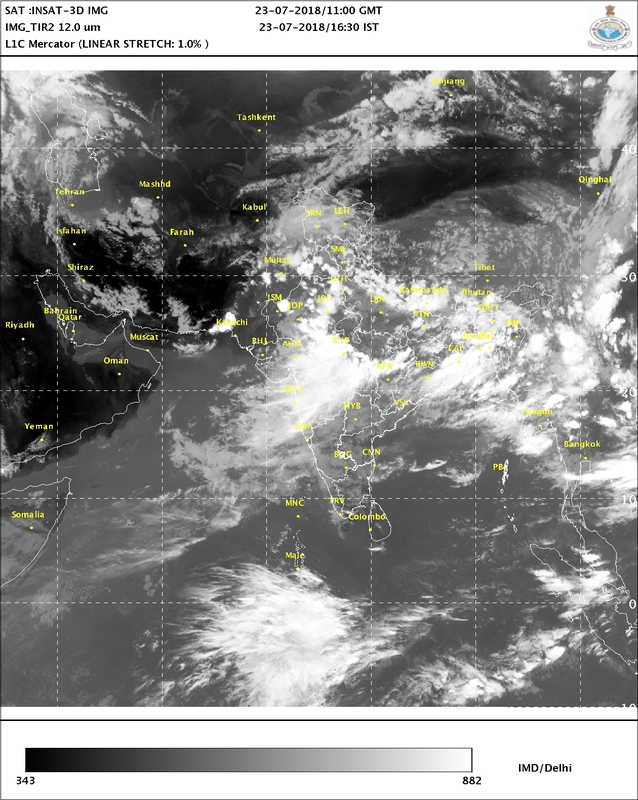 Under the influence of the UAC, there is a good chance of rainfall over Gujarat Districts bordering Rajasthan/M.P. and to a less extent over rest of North Gujarat & East Central Gujarat during 23rd to 27th July 2018. 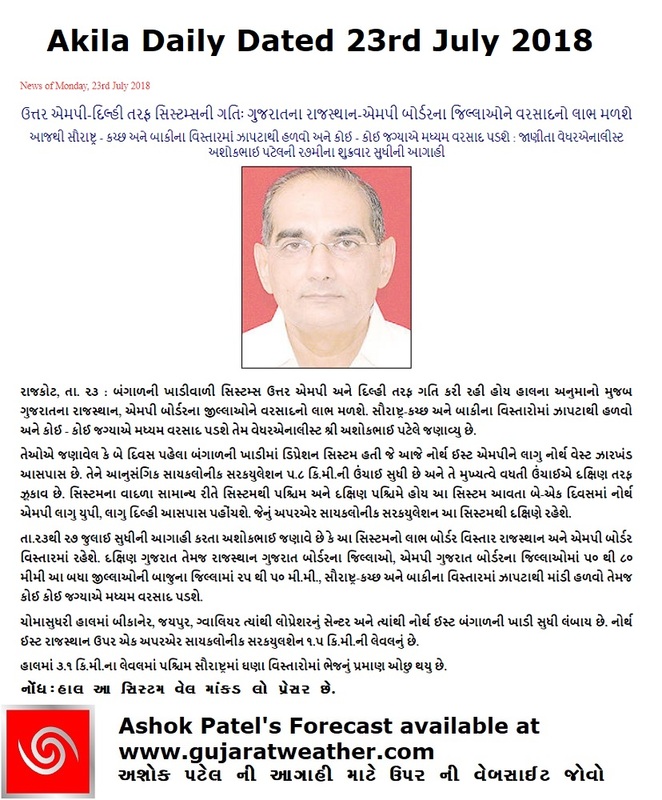 South Gujarat is also expected to get rain during this forecast period. 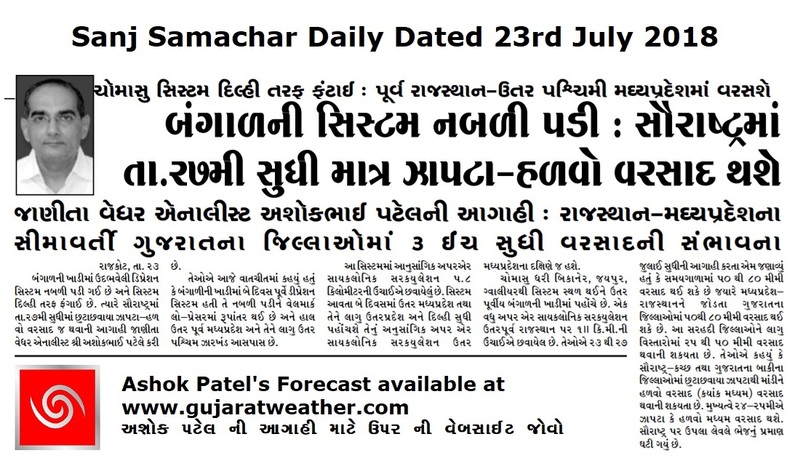 Saurashtra & Kutch expected to get less benefit due to less humidity at 3.1 km level over parts of Saurashtra & Kutch. North Gujarat Districts bordering Rajasthan & East Central Gujarat Districts bordering Madhya Pradesh expected to receive 50 mm to 80 mm rainfall during the forecast period along with South Gujarat. Rest of the Districts of North Gujarat, East Central Gujarat expected to receive 25 mm to 50 mm rainfall during the forecast period. Saurashtra & Kutch expected to get scattered showers/light rain and isolated medium rain on some days of the forecast period. Windy and Cloudy weather conditions expected over Saurashtra on most days. Windy conditions for Kutch on most days. બંગાળ ની ખાડી ની ડિપ્રેસન સિસ્ટમ ઝારખંડ બાજુ ગતિ કરેલ આજે નબળી પડી હવે વેલ માર્કંડ લો છે જે નોર્થઇસ્ટ એમપી ઉપર છે. તેના અનુંસંગિક યુએસી 5.8 કિમિ ની ઊંચાઈ સુધી છે અને વધતી ઊંચાઈએ દક્ષિણ તરફ ઝુકે છે. ચોમાસુ ધરી બિકાનેર,જયપુર, ગ્વાલિયર , સીધી, વેલ માર્કંડ લો નું સેન્ટર, અને ત્યાંથી નોર્થઇસ્ટ બંગાળ ની ખાડી સુધી લંબાય છે. એક યુએસી 1.5 કિમિ ના લેવલ પર નોર્થઇસ્ટ રાજસ્થાન અને લાગુ હરિયાણા નજીક છવાયેલ છે. સૌરાષ્ટ્ર માં પવન નું જોર રહેશે અને લગભગ દિવસો વાદળ છાયું વાતાવરણ રહેશે. કચ્છ માં પણ પવન નું જોર રહેશે. બંગાળ ની ખાડી ની સિસ્ટમ હાલ વેલ માર્કંડ લો છે જે નોર્થ એમપી /યુપી તરફ ગતિ કરે છે. અનૂસંગિક યુએસી નોર્થ એમપી પર આવશે જેની અસર થી રાજસ્થાન બોર્ડર ને લાગુ નોર્થ ગુજરાત ના જિલ્લા ઓ તેમજ એમપી બોર્ડર ને લાગુ ગુજરાત ના જિલ્લાઓ માં તેમજ દક્ષિણ ગુજરાત માં સારા વરસાદ ની શક્યતા છે. બાકી ના નોર્થ/મધ્ય ગુજરાત માં પણ વરસાદ ની શક્યતા છે. સૌરાષ્ટ્ર કચ્છ ઓછો ફાયદો છે કારણ કે 3.1 કિમિ ના લેવલ માં ભેજ અમૂક વિસ્તાર માં ઓછો છે. આગાહી સમય માં રાજસ્થાન ને લાગુ નોર્થ ગુજરાત ના જિલ્લાઓ માં, એમપી બોર્ડર ને લાગુ મધ્ય પૂર્વ ગુજરાતના જિલ્લાઓ અને દક્ષિણ ગુજરાત માં 50 મીલીમીટર થી 80 મીલીમીટર વરસાદ ની શક્યતા છે. આગાહી સમય માં મધ્ય ગુજરાત ના બાકી ના જિલ્લાઓ તેમજ નોર્થ ગુજરાત ના બાકી ના જિલ્લાઓ માં 25 મીલીમીટર થી 50 મીલીમીટર વરસાદ ની શક્યતા છે. આગાહી સમય માં સૌરાષ્ટ્ર અને કચ્છ માં છુટા છવાયા ઝાપટા, હળવો વરસાદ અને ક્યાંક ક્યાંક મધ્યમ વરસાદ આગાહી ના અમૂક દિવસો માં શક્યતા છે. 2 system bhegi thase windy ma batave che 29 date na ane majbut bani ne pachi mp uper aavse aena pachi khayal nathi ae kai baju jase ??? System ni asar dekhati nthi…Koi changes che sir?? Sir Evu bani sake ke agad jata jata nabali padeli system majbut pan thay? Haal aa System fari majboot thavnu IMD kahe chhe. System majboot thay to saurastra ma shakyta kevik? Sir actual weather forecast mate kai sanstha sari skymet k imd?? Sir badhu vikhay gayu ke su? Main System ghani dooor chhe. Windy ma 500 hpa ma to saurastra par khub saro bhej batave che to varsad na kay chance khara? Atyare je varsad chalu hoy te kya hpa model lagu pade che te kevi rite khabar pade. 700 hPa main varsad maate chhe… baaki 850 hPA aney pachhi 500 lagu padey. Sir chomasu ma 700hpana pavano normal Kai disana hoy koi system vagar? Southwest na pavan hoy. Pavan bhale judi direction hoy pan bhej hovo joiye. Dholka (Ahmadabad) last 3 hours thi halvo temj medium ane koi vaar bhare varsad pdi rhyo che… Pn continue chalu j che..
Upala level na bhej ane nichala level na bhej su che? Ane a bane level na bhej kay rite joy sakay? Windy ma he level ma bhej jovo hoy te select karo. By default surcase hoy tene unchu karo etle height vadhshe. pachhi te level ma Humidity select karo. Aanu naam Kudarati fer far ! Haal moto varsad nath dekhato tamare. Wonder ground vala ghote chadi gaya hoy evu lage chhe? Sir(1) krutrim varasad Gujarat ma sakya chhe? (2)Aapana deshma hal tena upar koi project chalu chhe? (3)krutrim varasad matena vadhare prayatno karavani jarur khari? Bhej haaj hoy tyare kari shakay pan mota vistar ma ochhu shakya. Haal China motey paaye Tibet ma Krutrim varsad maate na centero gothvey chhe… Land par. Sir 700 hpa ma bhej aavta divso ma saurastar ma ne pasi aakha gujrat ma varsad mate fari aek vakhat gote chadave aevu dekhay chhe? Gote chadave no matlab su? Positive k nagative? Wunderground ma fer far thata hoy etle te Mitra em kahe chhe ke Wunderground gotey chadyu…. pan hakikat em pan hoy ke Mitra gotey chadya hoy !